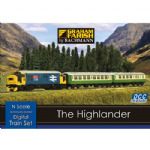 Graham Farish N scale sets are brilliant for the smaller household. They have the same level of detail as their larger OO cousins but take up half as much room. An N scale set could easily be stored under a child's bed, and both OO and N scales sets easily provide the hours of pleasure that come from owning your first train set.